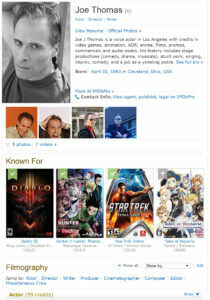 This entry was posted in Business, Musings, News and tagged IMDb, Joe J Thomas, JoeActor.com, Voice Acting, Voice Actor, Voice-Over by Joe's Dump. Bookmark the permalink. Joe, you “award geek” you! Which is supercilious, of course. Getting paid for a gig. Just seeing/hearing stuff you’ve done in a public medium. These are all things that fuel our personal/creative ambitions, IME. As Cyrano once said, “…every time I write a great line I thank myself a thousand times over!”. And why not? We’ve worked hard, applied ourselves, studied and done the research, and just friggin’ lucked out in a lot of ways. The first time I walked down Disneyland Main Street in the mid-90’s and saw a graphic or sign I’d worked on, believe me, I brightened up and pointed it out to whoever had the misfortune to be walking with me. But it’s a big deal to know that what we are doing is registering somewhere out there. 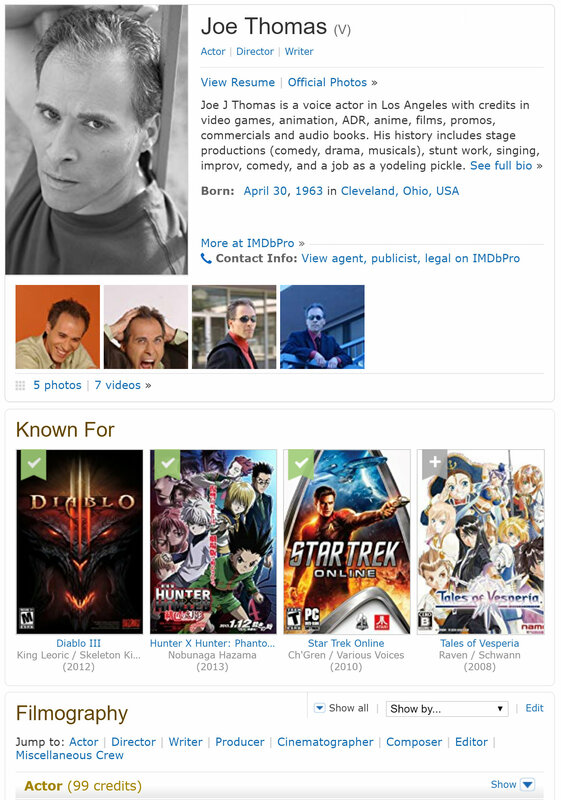 As for IMDB, it’s still the one place where we performers can keep track of our work and add pertinent info as we go along, even for free (to an extent). So GOOD FOR YOU, Mr. Joe. Let’s keep them entries adding up. Awesome journey, Bob! You’ve got a lot to be proud of… See you soon! I’ll buy that for a dollar! Thanks!